We had a beautiful spring-like day here in Oregon. I finished up a mini quilt that I’ve been working on this month featuring paper-piecing and a rainbow of colors! The pattern is called NY Beauty Circle of Geese by Janice of Better Off Thread. I’ve been admiring this pattern on my Instagram feed for a while and finally decided to tackle the curved piecing! I started out by selecting a range of rainbow fabrics from the new 2015 Sun Print line by Alison Glass and some Kona cottons. Just love these! My backgrounds are all low-volume prints from my stash. The quilt has 4 quadrants with some small curved piecing on the insides of each unit. I finally used a 1/4-inch fusible tape technique to help with these curves rather than pins. Much less trouble! 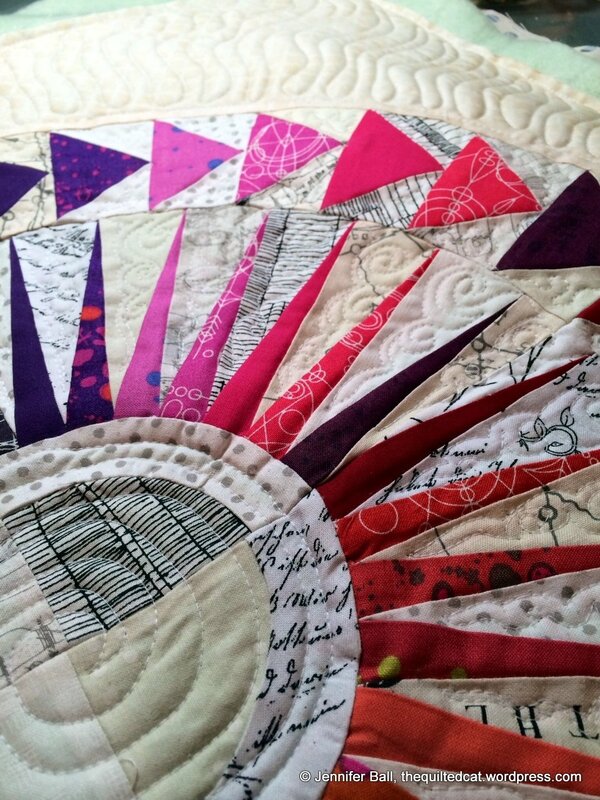 After finishing all 4 quadrants, I joined them together and quilted the mini on my HQ16 using Aurifil white thread and free-motioned some wavy, radiating rays from the flying geese out to the edges of the mini quilt. I did some tiny free-motion swirls on the inside low-volume fabrics and concentric circles in the middle. Once I finished the quilting, I set the mini down on the floor for a quick picture when this guy showed up! My quilting inspector. I think Tiger likes the mini quilt! I convinced him to let me have the quilt back so I could add the binding. I selected a gray print so that it framed the quilt without detracting from the rainbow fabrics. 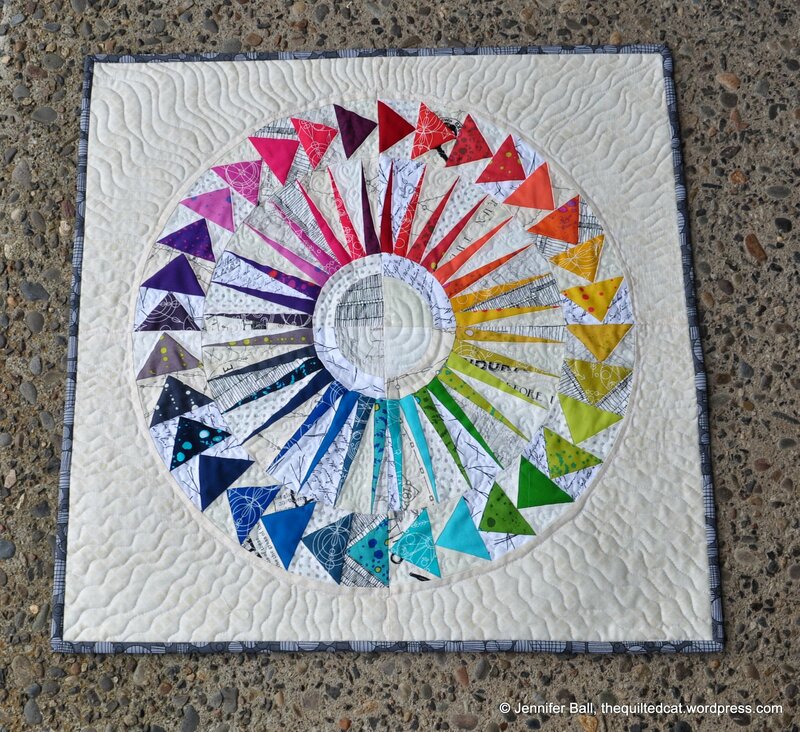 Here’s my completed NY Beauty Circle of Geese mini-quilt! I really enjoyed making this mini quilt. It’s so cheerful and bright in my quilting space. 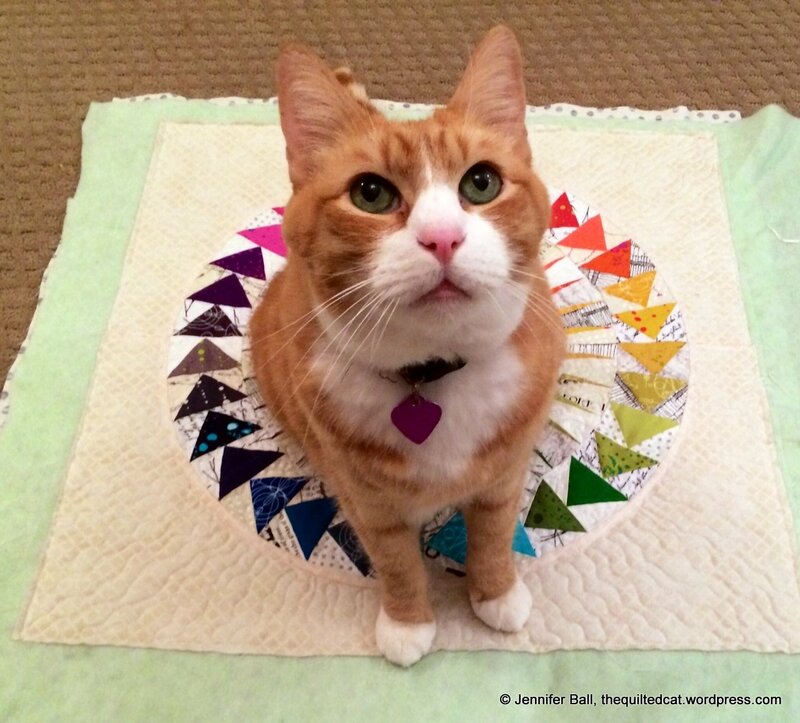 This entry was posted in Cats, Mini quilts, Modern, Quilts and tagged Alison Glass, Aurifil, Better Off Thread, Kona, NY Beauty Circle of Geese, paper piecing, Rainbow quilt, Sun Print by thequiltedcat. Bookmark the permalink. WOW! That is amazing. I love everything about this mini quilt!! 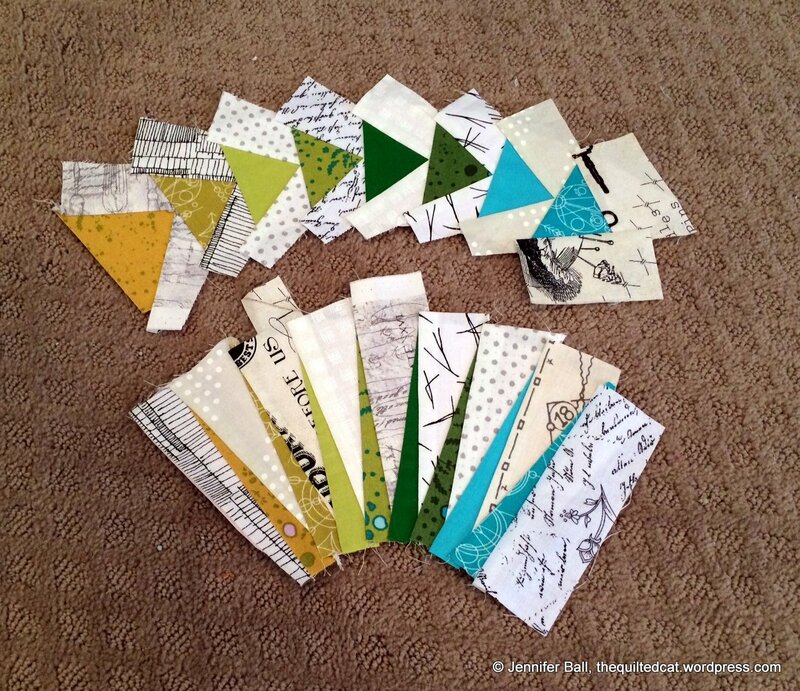 Can you tell us more about the fusible tape technique you used? It’s absolutely fabulous! What a stunning piece. Jennifer! This is amazing!! I also follow Janice and really like her patterns! Yours is gorgeous!!! Thanks for sharing!! !